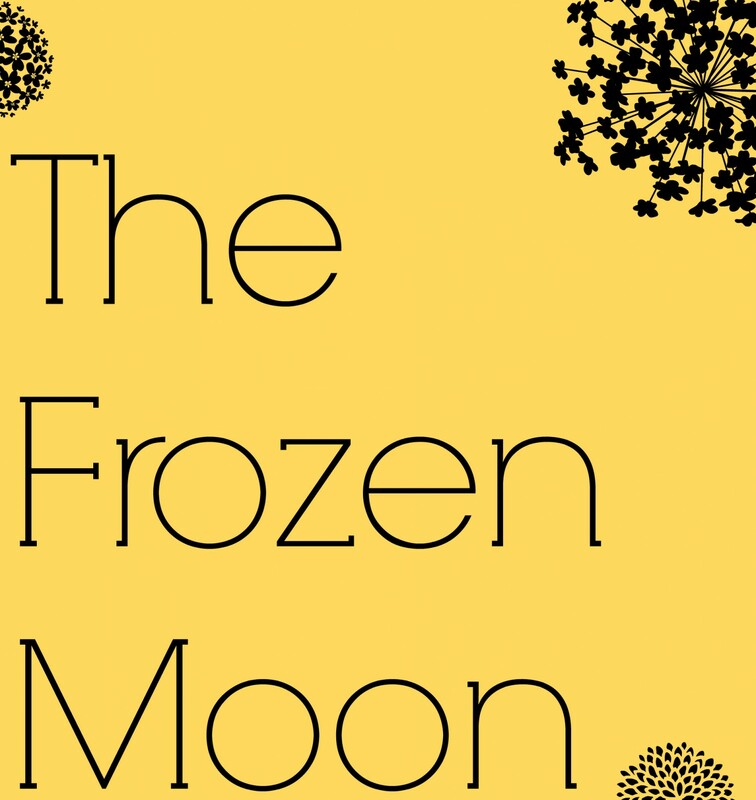 About: Why The Frozen Moon? It’s December and I’m looking back. It has always been a month of retrospection for me. It is the finality of closing a year, of looking back over what the months have brought. It is the Christmas season and all of the tradition and nostalgia that comes with along. It is the month I became a mother, eight (impossibly swiftly moving), years ago. We are a light family. We dance in the kitchen, wrestle with our kids in the living room and toss pillows and towels and blankets over our heads (or throw them at each other’s heads) nine or ten times a day. We are lighthearted, my husband and I. And we try to pass this on to our kids, let them know that making a mistake is more bearable if you laugh it off, that (minor) boo-boo’s can be fixed by shaking it out, or getting a quick peck from Mom or Dad. That sometimes you just need to dive off of the couch into a pile of pillows, and that’s okay. But kids are smarter than that, more intuitive. And despite our best efforts to not let them see the burden that we’re carrying, they do. Even my little son, not yet three, knows that his mom and dad are struggling, he reads us better than we read ourselves. Standing in store check-out line, I’m humming and holding The Boss to keep him from running amuck through the aisles of Christmas decorations. He pulls back from me and looks me squarely in the eye. “It’ll be ok, Momma,” he tells me. And though I’d been masking my worries through humming and smiling and pointing out the big Santa decorations and the plastic snow globes that inflate on your lawn and spew Styrofoam snowflakes – he hasn’t been fooled. I saw the woman who fired my husband last night. The hotel I work at is practically in the same parking lot as hers (and they’re currently at war, nothing to do with what happened with my husband). She came through the lobby door, pulling her gloves on her hands, too distracted to notice who was behind the desk. When she looked up and met my eyes, her face turned red, turned raspberry, maroon even. She stumbled over herself, almost turned back around to leave. My presence had caught her off guard – the friend she was coming to see wasn’t at the desk, and in her place was the woman working 40+ hours a week to keep her family afloat in the wake of what she did to her husband, her family. My kids haven’t had their annual doctors appointments, we don’t have insurance. I smiled at her politely, treated her with the same warmth and welcome as I do any of the guests who walk through our door. And when she left, I smiled and waved and would’ve sent her off with a pleasant “have a good night…” had I not been on the telephone with a guest. I felt a burden lifted. I am not bitter. She may have disrupted my life, but she has not disrupted my heart. We are a light-hearted family. We dance in the kitchen and laugh off our mistakes and let love heal what we can not. Last night, five Decembers, two additional children, two new positions for my husband and one small start-up photography business for myself, I swiped my debit card at Walmart for a rather large purchase. When the cashier double checked with me that I did, in fact, want to use debit and not credit, I nodded. When she asked if I was sure, and wouldn’t I like to open a Walmart credit card, I kindly told her no thank you, don’t like to spend more than I can pay for. And as I gathered my bags, I was blown away by how big and how great my God is, to have taken us from penny pinching, late-fees and overnight hotel shifts to make ends almost meet, to this place. Overwhelmed by the season, by the belief that God blesses the hands that bless, that He welcomes the hearts that seek and He does not leave us where we are, but makes way – I practically emptied my purse into the little red bucket by the bell ringers as I left the store. But I know, just in reading over my words from five years ago, that the intangible peace and joy in my heart comes not from bank accounts or a busy wedding season already on the calendar for next year. (None of which I had back then.) In fact, this joy has very little do to with me at all, except that I welcome it into my heart. And that’s my Christmas wish for you too. Be joyful and be joy-filled. Writer, Photographer, Wife, Mother to four rambunctious and amazing children.